One question that always lingering in the mind of Windows XP and Windows Vista users is probably if the existing PC system can be upgraded (or is allowed to upgrade) to Windows 7, or if even upgrade to Windows 7 allowed. Unlike any previous Windows OS launches, Windows 7 does not support direct in-place upgrade from all earlier versions of Windows operating system. In fact, anything earlier than Vista is not supported for upgrading. Note: Do not confuse “upgrade” to Windows 7 (move to new version) with Windows 7 Upgrade license, which make available Windows 7 at cheaper price (Windows 7 retail price list) for existing Windows users, even though existing PC cannot be “upgraded” to Windows 7 via in-place upgrade method. 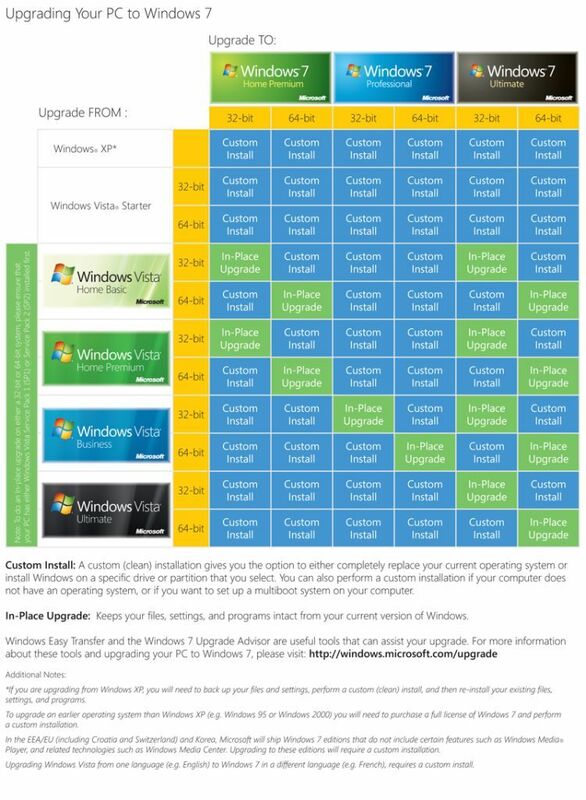 If the official Windows 7 supported and unsupported upgrade paths is too complicated to understand, Microsoft has also made available an upgrade chart, which showing whether existing Windows XP and Windows Vista and their editions can or cannot be in-place to an edition of Windows 7, in colorful tabular format. In-place upgrade allows end-user to move to Windows 7 and keep existing files, settings and programs intact from current version of Windows. If in-place upgrade is not supported, user has to perform custom install, which basically meant end-user has only two choices – wipe clean and/or format existing partition or hard disk to replace current Windows operating system with Windows 7, or install Windows 7 onto a specific drive or partition (that does not have Windows installed yet) to set up dualboot or multiboot system on the computer. If your current version of Windows does not support in-place upgrade to Windows 7, use Windows Easy Transfer to backup and transfer the files and settings. Windows XP users have a workaround to in-place upgrade to Vista then to Windows 7. To support in-place upgrade, Windows Vista must have Windows Vista Service Pack 1 (SP1) or Windows Vista Service Pack 2 installed. All information about Windows 7 is available here.